It’s already been a busy day – we met with the electrician to specify where we want recessed lights, pendants, sconces, outlets and light switches. Talk about making a lot of big decisions all at once! It’s kind of hard to tell what’s going on, but on the electrical floor plan below you can get a rough idea of where can lights will be, etc. 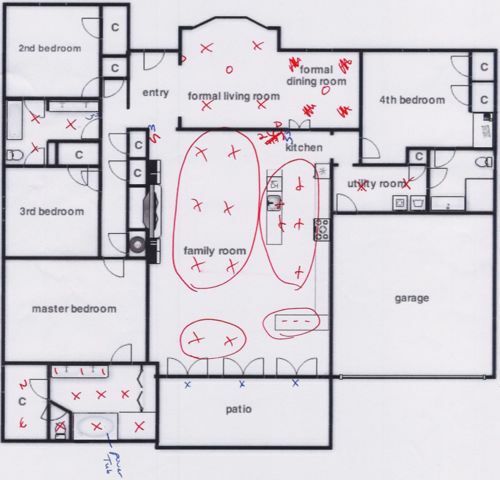 And you can see in the floor plan above that we’ve made some changes to the layout in the master bath, as well as with the kitchen cabinetry (more about that in another post). 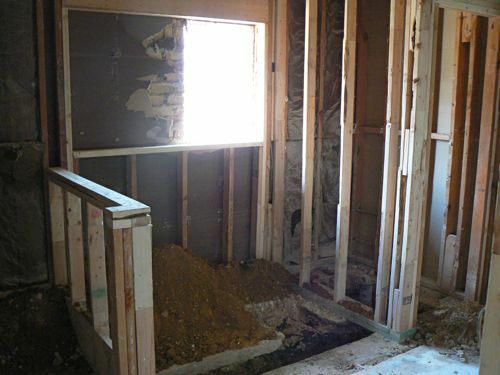 This morning they also started cutting a trench through the concrete slab foundation in the master bathroom to move the plumbing around a bit. Or a lot, actually. I’ve never seen such dust in my entire life!! The concrete guys cut the trench based upon spray painted guidelines that the plumber left of the floor. However, just as I was about to fork over a check to the concrete guys we realized that the trench had been cut on the wrong side of the guidelines. Whoops. Luckily the fix didn’t turn out to be a big deal, and about 10 minutes later the concrete guys got their check. Crisis averted!! We also met with the millwork guy that will be supplying all of our trim and doors – and by the way, we went with Door No. 1!! Thanks so much for helping us make up our minds about that one. Oh yeah, and the framer also made an appearance to get his final check. That’s all for now, folks! We’re having a garage sale tomorrow (yes, another one!) so I need to get my act together. Have a great weekend!! yay for progress! i can’t wait to hear more about the new ceiling! how far along is the entire project at this point? So awesome and I can’t believe it’s already been over three weeks! Love these updates – are you putting a chandelier in the living room? I so wish I lived in Dallas – I’d be at your yard sale in a heartbeat! Have a great weekend Liz! Wow, there are so many things going on in your flip! As I sit here in my “fat pants” with a Coke by my side reading of the wild activity over there, I may need to slide off and take a mini-nap. You guys made a lot of choices, and sometimes I wonder what the guys were drinking when they made some of the electrical choices in our house . . . we have light switches in corners AWAy from any entrance, plugs that I have to crawl up on the counter and lie on my back to access on the bottom of the kitchen upper cabinets. Keep up with the updates from the front!